If there’s one thing about space on which we can all agree surely it’s that it’s pretty big. Maybe even too big. So big that it can hurt our collective souls – as Carl Sagan once memorably said, ‘The universe is not required to be in perfect harmony with human ambition’. Humanity yearns to taste infinity and yet the cruelty of physics is that it forever keeps us constrained within an area of effect defined by the harshest laws of relativistic acceleration. Looking out into the endless blackness of the visible universe is a melancholy experience. Most of us will live and die on the same tired soil we touched at our birth. How dreadfully depressing. How exquisitely humbling. Why then do game designers keep trying to scale the infinity of the cosmos to human experience? 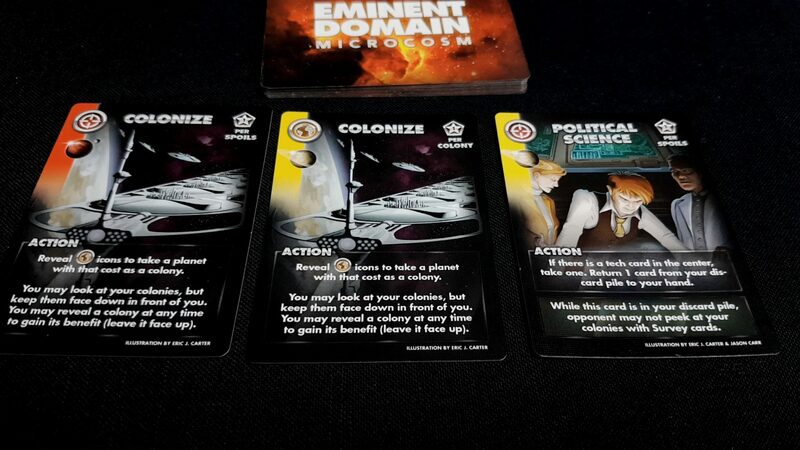 What is the perverse motivation behind producing a small-box space game like Eminent Domain: Microcosm? It’s hard enough to come to terms with the reality of our surly bonds – why celebrate them with excessive minimalism? That’s maybe just my hang-up but it’s a serious point. Think of the swirling majesty of our universe. Do you really not feel just a bit aggrieved that you’ll never see even the smallest percentage of an appreciable fraction of a sliver of the magic it has to show? On Saturn and Jupiter, rains of diamond spill down from a sky of soot and methane before the atmospheric pressures turn them into molten lakes of glittering gemstone. The largest volcano in the solar system is three times taller than Everest and could erupt in a spectacular inferno of lava in our lifetimes. Every single one of us is made up of exquisitely refined matter that was forged in the heart of dying star and then ejected in a supernova of phenomenal energy and magnificence. All of that is in our cosmic backyard. Who knows what wonders the rest of the universe has hidden away behind the inarguable gatekeeper of mean-spirited distance? If a space game is going to successfully land in my affections it’s going to have to first and foremost bridge the gap between my deepest longings and the frustrated and angry limitations with which reality has shackled me. 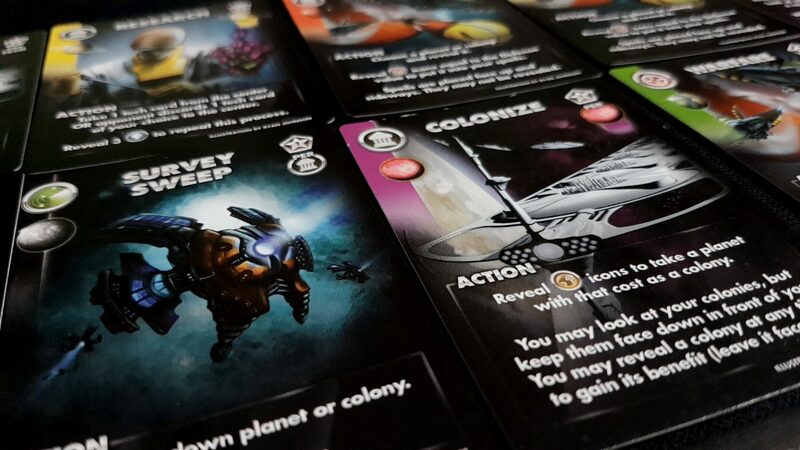 Games about space need huge ambition, and it’s rare indeed that a microgame can fit them in its tight constraints. Eminent Domain: Microcosm is not an exception. Everything about Microcosm is bereft of grandeur – that’s not necessarily a failing but it’s a feature that would have been less jarring had the theme been something more inherently constrictive. There are five technologies that can be researched in the game. Eleven planets that can be conquered or colonised. Eighteen actions that will be taken over the course of play. The tagline of the game proclaims ‘2 players. 10 minutes. The whole cosmos’. It’s two truths and a wretched lie. 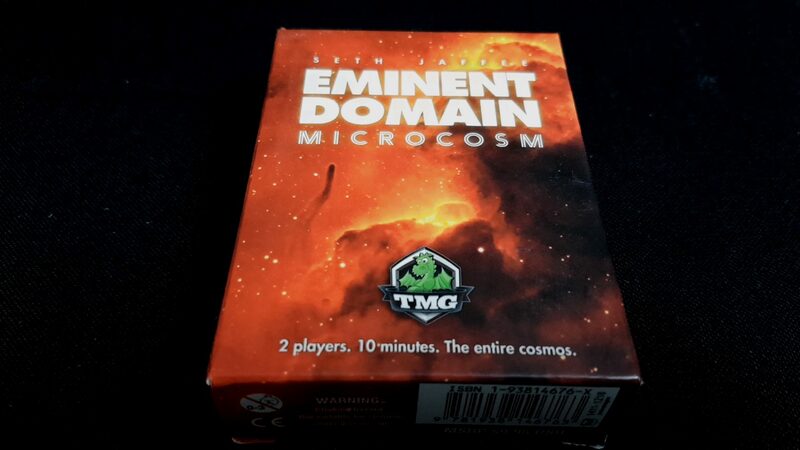 Sure, Eminent Domain: Microcosm is a small version of a much larger game but I haven’t played its big brother so I can’t get upset at that one. It’s not the one that is currently lying to me. Microcosm works like this – every turn you take a card from the three on offer. You play a card from your hand, often the one you just picked up, and action its effect. The played card goes to a discard pile where it can later be reclaimed if you forfeit your action. Some cards have special powers that are only triggered while the card is in your discard pile. Actions let you colonise planets, conquer colonies, claim research technologies and a few other things. Each card you claim has a scoring context associated with it and at the end of the eighteen actions of the game you sum up all the points in the usual manner. It’s definitely two players. It’s genuinely done in ten minutes. The whole cosmos, though? Not even a bit of it. You might at this point be rolling your eyes – it’s not a game design sin that someone tries to stuff big ambitions into a small box, and my own frustrations about the constraints of physics don’t make it a bad game. The thing is though that it’s not an irrelevant aside designed to bulk out an otherwise emaciated review. My expectations of an experience are absolutely bound up in an assumption of momentum and duration. The perfunctory nature of the cosmos inside Microcosm is the reason that I find it unsatisfying to play. There’s just… nothing really to it except some neat ideas and a conceit that undercuts the game’s ability to realize them. Cards that have a buff effect while they are in your discard pile, forcing you to weigh up the value of their actions versus the bonuses associated with their unavailability. A technology tug of war where your research can deny an advance to an opponent. It models a technological arms race in a marvelous and efficient way by representing it entirely as relative advantage. Planet ownership that empowers your ability to carry out other activities, but at the risk of revealing their presence and capabilities to your opponent. Direct player competition where claimed colonies can be conquered and turned into spoils, where the risk of conquest is mediated by the amount of reconnaissance you’re willing to do. This is enough to carry a much larger game, and certainly in terms of ‘feature density’ Microcosm ranks up there with the best. The problem though is that successful execution of an idea by itself is only one part of a game – what also matters is the ramp up and the ramp down around those ideas. There’s a period of time that each of these mechanisms needs to grow into itself and every single one of them takes longer than the nine cards you draw over the course of play. To get them to interlock – well, that needs even more time. Games like this should finish just before the engine is about to become too effective to be interesting. At the end of Microcosm though you just blink and say ‘Wait, was that it? I didn’t even get my key anywhere near the ignition’. The problem here isn’t the size of the box. We gave a very positive review to Tiny Epic Galaxies because its diminutive form factor didn’t stop the designer fitting a great game within. The problem here isn’t the parsimony of components or the lack of fancy bits and doodads. Look at our review of Hanamikoji for a veritable love letter to a game with even fewer of both. The problem is that it’s designed around a play-time of ten minutes with a set of interlocking rules that would take an hour to really give you the room to enjoy them. Hell, you need about thirty minutes to even get a chance to experience them. The theme, the scope, the playtime and the ruleset are all acting against each other to create a game that is at war with its own better nature. It’s a game trying so hard to make itself seem small in a universe where such an activity is bafflingly unnecessary. 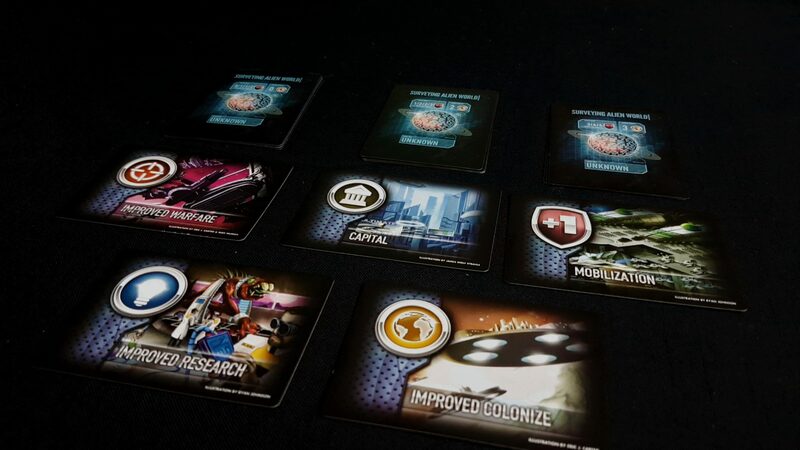 And perhaps a larger taste of this is exactly what Eminent Domain proper offers – I haven’t played it so I don’t know. Perhaps I’m being unduly harsh on a microgame that is merely designed to offer an aperitif ahead of more substantial fare. That’s really besides the point though – Microcosm is the game I bought, Microcosm is the game I played. As such, it has to stand on its own merits. It’s not enough to justify it as being a flavouring of something better. For those of us with no existing attachment to Eminent Domain itself there’s a functional game in here that is glaring in its design incompatibilities. In seeking to miniaturise the experience of space conquest it has given us a cosmos that is only cursory in its scope and tight-fisted in its playtime. Some of this is undoubtedly because of my own preconceptions. What if this had been a game about, say, the age of exploration or the slow crawl of civilization across the Mesopotamian flood plains? I suspect I would have been a good deal more complimentary. If it had been a game focused around a martial-arts tournament I probably would have lauded it for accomplishing so much with so few moving parts. The card play is tight and the consequence of each action is weighty. Reskinned into a more intricate and focused duel it would probably have been marvelous. As ‘Karate Kid: The Game’ I would have been happily yelling ‘sweep the leg’ as we wrestled for advantage (research) and score (planets). It could have easily done it too – dominance of ring position (colonisation), command of mobility (political actions) and quick flurries of attacks (warfare). It’s not that the game is insubstantial or desultory. The list of ideas that I outlined above is evidence enough to defend against that allegation. It’s just that I don’t think this theme, fundamentally in any context, can survive a lack of ambition in scope. I can’t just discount that. There’s a thematic dissonance in here that makes the mechanisms genuinely less engaging for me. A good theme can elevate a game far beyond its own mechanical accomplishments. A theme badly expressed though can just as easily bind an otherwise good game’s wings. 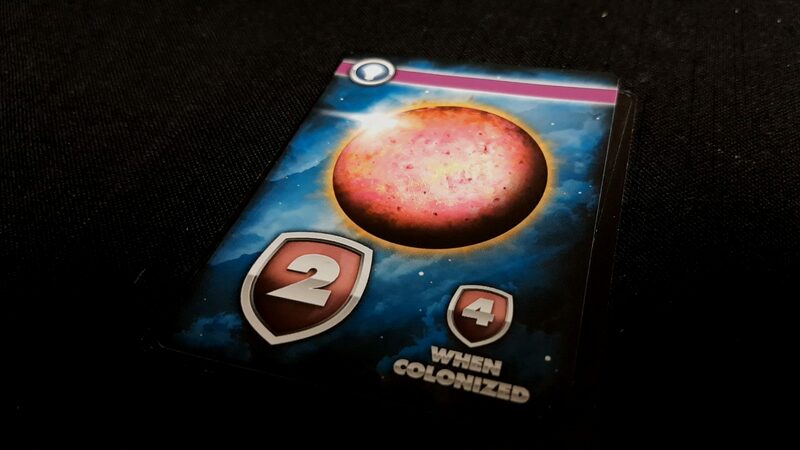 There is so much creativity in Eminent Domain: Microcosm that I would have loved it if the systems were given room to fly. In the end you can only judge a game though on what it claims to be. It’s certainly a microcosm, but hardly one that is eminent. Remember the promise. Two players. Ten minutes. The entire cosmos. It’s a compelling pitch, but ultimately infinity just doesn’t fit into a small box. Few want to conquer a pocket universe.